WHEN viewed from the perspective of the Ministry of Information's film division, the Second World War in Britain takes on a softer, more unconventional hue. Novice scriptwriter Catrin Cole (Gemma Arterton) flourishes in this smoky, blokey but nevertheless sheltered environment. Hired to lend "a woman's touch” to the ministry's turgid news reels, the former secretary finds herself in the right place at the right time. Cole's natural flair for dialogue is quickly noticed by the cynical but quick-witted lead writer, Buckley (Sam Claflin). The pair embark upon an epic feature film, based on the evacuation of Dunkirk, to bolster the country's morale. Obstacles to be overcome along the way include the two women upon whose story the film is based (the newspapers embellished the details of their daring boat trip). More challenging, perhaps, is the insistence of the film's American investors that they feature a handsome US war hero (Jake Lacy) in a key role - since the pilot can't act his way out of a paper bag. Running further interference is Bill Nighy's ageing matinee idol, a vain and self-absorbed luvvie who refuses to accept that his star is on the wane. As the bombs fall and gender roles are challenged, life imitates art and sparks fly. Director Lone Scherfig (An Education) navigates a tonally tricky path between tragedy and comedy with remarkable assurance. Arterton is superb in the role of Cole, a plucky young proto-feminist who learns how to hold her own in a male-dominated environment when WWII offers undreamed of opportunities. And Claflin (best known as Finnick Odair in The Hunger Games) gets the chance to show a whole other side to his acting persona as the seedy, weedy Buckley. The humour is unexpected and the sexual frisson develops naturally, at its own uneven pace. Funny, smart and deliciously unpredictable. 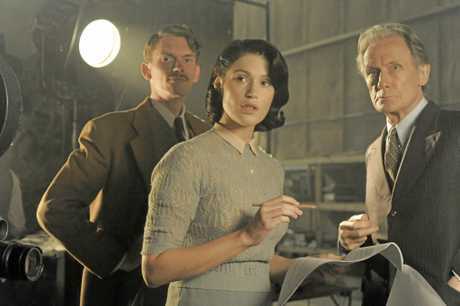 THEIR FINEST OPENS ON THURSDAY, APRIL 20.